THE TOP MOST HAUNTED DOLLS IN THE WORLD: "How To Tell If A Doll Is Really Haunted"
Can a little girl's doll or even an action figure belonging to a young boy become haunted or possessed by a real ghost or something unknown from the other side? Many individuals believe so and often try to rid themselves of the unpleasant "Dead"paranormal creatures. But still others search sites looking for the ultimate haunted doll to own, cherish.... and be afraid of! "THE MOST HAUNTED DOLLS IN THE WORLD "
"How To Tell If A Doll Is Really Haunted"
"The Real Clues On How To Tell If A Doll Is Really Haunted"
The three traditional paranormal haunted doll methods for gathering paranormal information interviews, observation and document searches. Want to know if your doll is really haunted by a real ghost? Interview the person who the doll belongs to original. Talk to them and listen to them open and honestly. Question them thoroughly. Ask how and when they came by the doll. Get the full history of where the doll has been, who it came from and why. The best sources are folks who were or are directly involved in the haunting and the possession of the doll. Introduce yourself to them physically or by phone. Email just is not the same when it comes to finding out if the doll your just purchased on EBAY is really haunted. Tell them why you are investigating them and the doll. Let them know if you are recording the interview, be sure to ask permission first. It is illegal in many places to record someone without their consent. If you are unsure of your ability to take accurate notes, record the interview. Start by getting the source's name, and its spelling, as well as his or her official title, if it is relevant to the investigation. Ask questions that cannot be answered with a 'yes' or a 'no.' Instead, ask people to describe the dolls haunting activities. the times it happens, days of the week. Get all the info in advance of all incidents in detail. Question them on , and about of how they saw the doll perform a paranormal act. Listen as they respond and imagine what additional information you really need to believe them. Then ask follow-up questions about it's physical description, it's movement, age etc..
Where they keep it in the home. who else lives their birds, dogs, cats children and if they have a happy home. All this can be important in the long run and if the doll is haunted you can and soon will understand why. Don't get intimidated and feel afraid that you are asking "dumb" or outright stupid haunted doll questions. If your source says something you do not understand, ask them to repeat it and explain it in simpler terms. If something a source says does not make sense to you, say why and ask for an explanation. If you don't understand something, other you would tell it to will not as well. Always be polite and respectful when interviewing someone about their paranormal experiences no matter how off the wall it is. Don't allow a haunted Doll source to intimidate you into not asking tough, appropriate questions. If your a field investigator of paranormal phenomena you should already know your five senses can provide the details. Lets say you spend several hours waiting for a haunted doll to move dance or sing and nothing happens. Document it all. "Even if you are "just" felt it was a big waste of time and money:" What do you see? Hear? Smell? Feel? Drop those details into your notes. Then ignore the doll. Place it somewhere and photograph the doll in it's new resting place. Or set up a camera to watch it then go about your life as normal. Try sitting alone for 30 minutes and just stare and study the doll, then write down about what you saw. Use your haunted as practice in developing your paranormal observational skills. Then leave the doll alone completely isolate it. set it in a room you don't go in but pass quite often. look in on it at different times of the day or night. photograph it compare images to see if it moved. Then ignore it for a week or more then do the same after that. If something spooky has happened in the mean time you have your have your first clues. But remember just because a doll haunted it's past owner in a certain way does not mean it will haunt you the same. The doll just might go dormant and want nothing to do with you. And if this happens then it is time to move the doll on to it's next owner. The next owner should be someone you know. You should tell them all you know is the doll was reported as haunted and could or would they keep it for a month or so just to see if it performs a paranormal trick or two for them while in their possession. Going back to you past notes see if it does an old trick or two. But in finding out if a doll is really haunted you might still have to wait 6 months are longer to know with more experiments and documentation to do. If the doll fails it's one month investigation then it is time to go back to your original haunted doll owner notes. Try to put the doll in the same environment as it lived before. You should already know where it lived in a former home from your questions and what pets family and if is sat in a closet or in a fine display case by a fire place. Try to recreate it's former home. Either in yours or someone else's that is similar to where the doll came from. If after this month goes by and the doll does not stand up and whistle dixie then you might have been duped. The next step of your investigation is again simple. Get the haunted doll take it home and start your investigation over again. Call up the original owner and question them to see if their life has changed or if it is still haunted. Chances are the ghost might have decided it did not want to travel through the mail or by fed EX. If that's the case ask the owner to tell the ghost to find it's old body . it might try to track it down and haunt the doll again .... or not. If they say life is better. You should then place the doll in a spot where you can watch it daily. If the doll starts then haunting you, and you know it is not your imagination, then you know for sure it is haunted. But if not then send it on it's merry way, or keep it as a lesson in paranormal exploration of future real haunted dolls that might just cross your path. 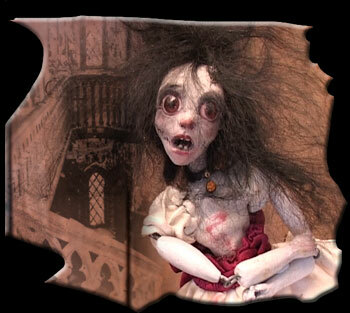 Here you can view Large images and read about these real extremely active haunted dolls. The Top 15 "Most Real Haunted Dolls In The World!" 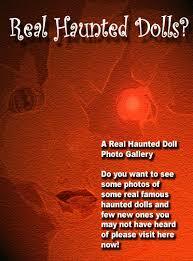 Click a Thumbnail to view image below to read each full haunted doll story. A vast number of paranormal experts and investigators spend much of their time investigating these portable haunted items. Ebay is often filled with haunted doll claims. But are they all haunted by a real ghost or is it a ploy just to make a few bucks off of the unknowing buyers. One must often believe when buying any haunted item the haunting is in the eye of the beholder. Often many find that their haunted doll is haunting them by the price they had to pay to own it. But one beliefs is that a haunted doll with a genuine ghost attached may only have an effect on a certain owner not on all who's hands it passes through. More and more paranormalist or now investigating the owners of the dolls that make their claims and their haunted babies together and forgoing purchasing them to investigate openly. While haunted doll stories are not uncommon, the case of real haunted dolls are unique in that so many claim to have witnessed their paranormal and haunted movements first-hand. Many real Haunted Doll Owners who have seen and claim to have witnessed these living dead dolls expression changing into a menacing grins, hearing the dolls giggle cry, laugh and even speak. Today, many a haunted doll live quite comfortably, though well guarded by their owners. Visitors are welcome to see them here in the haunted doll Museum, though taking pictures has proven to be difficult for some of their owners. Cameras tend to stop working when pointed at the doll, only to resume normal function when pointed in the opposite direction. 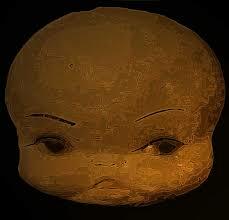 Dolls, simple child’s playthings, primitive or highly stylized, have been around for centuries. Every culture seems to create these little imitations of humans and all seem to do so for the same purpose: to provide companionship, entertainment and comfort to our children. With such innocent and well-intentioned origins, what could possibly bother, or, in some cases even terrify us about these loving childhood companions? Please contact us and we will tell you how to send them as jpg or wav files attached to your email. Email us click here. By Sharon Stajda,Key West, Florida. Its not that unusual for a young child to have an imaginary friend or two. Often times parents think it cute? 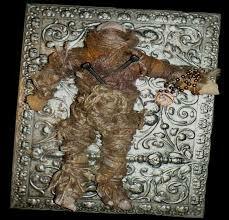 haunted doll, great deals on Everything Else, Dolls Bears on eBay! Buy haunted doll, Everything Else on eBay. Find great deals on Dolls Bears, Pet Supplies and get what you want now! Ravensbreath & Ghost Dolls brand © 2006-2009 all rights reserved.